Most of us these days spend a substantial portion of our day in our email inbox, I came across an interesting fact in a Huffington Post article which pointed out that U.S workers spend on average 6.3 hours in email. One aspect of my daily workflow that I have struggled with is effectively managing email follow up, specifically having a system in that shows you all the emails that you need to follow up and when. Have you ever experienced that dreaded feeling when a colleague or your boss asks you “where are we at with XYZ” and you think to yourself, “Ohh sh*t, I forgot to follow that up!”. Given the ever-increasing demands on our time and the sheer volume of requests coming in each day, I realised that if I was going to have shot at keeping on top of email follow up, I needed a trusted system, one that won’t require my brain to remember everything that I need to follow up and when. 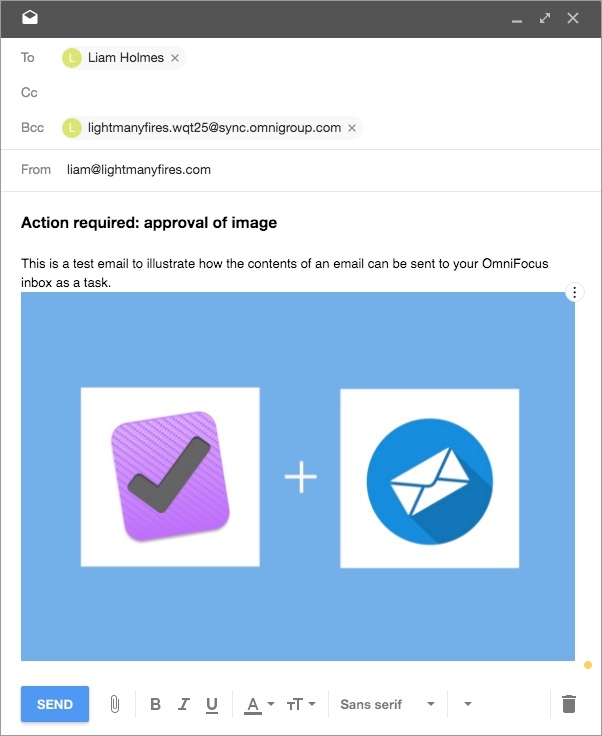 In this post, I am going to illustrate how I use OmniFocus to track email correspondence, specifically what emails that I need to follow up and when. This tactic is super easy to implement, and it is the foundation of how I manage email follow up. If you’re a current Omnifocus user then great, if you’re not, OmniFocus is a Mac and iOS productivity app built upon David Allans “Getting Things Done” methodology. If you’re new to the “Getting Things Done” framework, I highly recommend you check out the Getting Things Done site for more information. Furthermore, if you’re new to OmniFocus check out The Omni Group who are the makers of OmniFocus for further information on the application. What I do when composing an email is to simply add my Mail Drop email address to the Bcc field of the email, then boom!, that email get’s displayed as a task in my OmniFocus inbox. From here, I can then process the task as per my normal OmniFocus routine. Ok, let’s set this up! Assuming you have OmniFocus installed on your Mac and you do don’t have an OmniSync server set up. Head over to https://manage.sync.omnigroup.com/ and sign up for an account. It’s free! Once you’re logged into your account, you’ll need to add an address. Click the “Add an address” button. 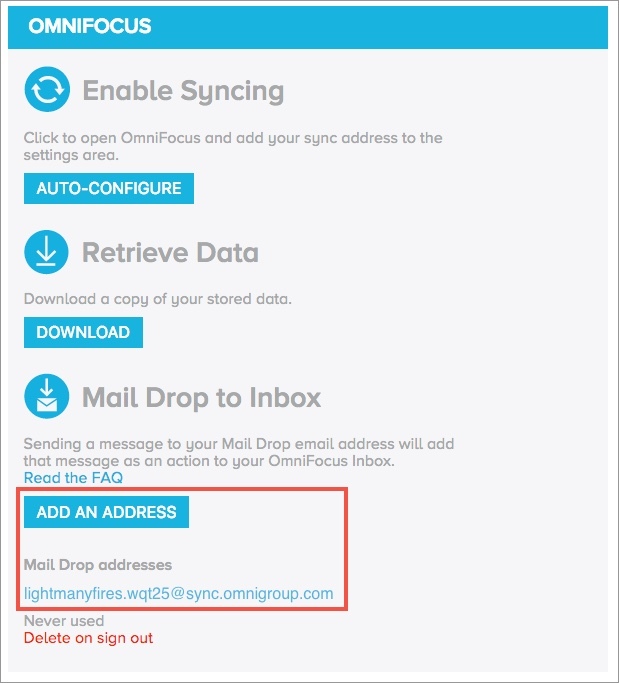 Once you have, you’ll be assigned a Mail Drop email address as seen below. In your email client of choice, compose an email and add your Mail Drop email address to the Bcc field. 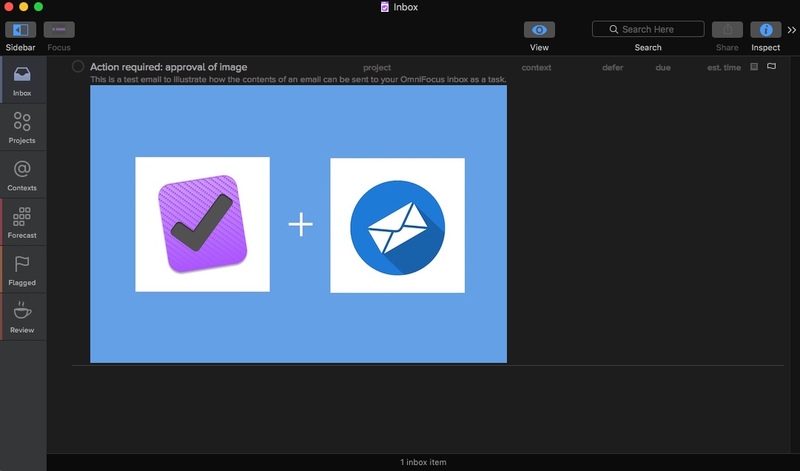 For demonstration purposes, I have also added an image attachment to illustrate that attachments will be included in your OmniFocus task. Now head over to your OmniFocus inbox, and after the sync has finished, you’ll see your email added as a task. Add the project this email is related to, the context for follow-up and the defer and due date. You may wish to create a context such as “email follow-up”, that way you can easily see all your emails that you need follow up by selecting that context. Note: Add your Mail Drop email address to your contacts for quick access when composing an email. As you may have picked up, this tactic works great for the initial email, however, what about ongoing correspondence? Unfortunately, there is no way to keep both the email thread and OmniFocus task in sync. However, you have 2 options. Use the note section of the task created by the initial email to track any ongoing conversation. BCC your Mail Drop address for each reply to the email thread. However, this will create a new task for each reply, and you can check off the older tasks tracking the email. This way, you’ll have the most up to date email correspondence in OmniFocus. I employ both tactics on a weekly basis, but I don’t have an opinion on which method is better. If you have any questions or comments, please leave them in the comments section below, and I’ll get back to you as soon as I can.